Both the cold and flu symptoms are respiratory ailments caused by viruses, although they are different ones. They are very different from bacteria (they are many times smaller) so antibiotics will not affect the viral flu or cold at all. In fact getting antibiotics may actually do more harm as it will weaken your immune system. That is definitely not what we want. The symptoms can cause a world of misery, from fever and cough to a sore throat, nasal congestion, aches, and chills. But there are ways to feel better. If the following do it yourself remedies do not work, then it might just be about time you visit your doctor. Staying warm and resting when you first come down with a cold or the flu helps your body direct its energy toward the immune battle. This battle taxes the body. So give it a little help by staying off your feet. Hot liquids help relieve nasal congestion, prevent dehydration and soothe the uncomfortably inflamed membranes that line your nose and throat. If you’re so congested you can’t sleep at night, try a hot toddy, an age-old remedy. Make a cup of hot herbal tea. Add one teaspoon of honey and one small measure of whiskey. Limit yourself to one. It’s important to blow your nose regularly when you have a cold rather than sniffling mucus back into your head. But when you blow hard, pressure can move germ-carrying phlegm back into your ear passages, causing earache. A small dab of mentholated cream under your nose can open breathing passages and help repair the irritated skin at the base of the nose. Menthol, eucalyptus, and camphor all have mild numbing ingredients that may help relieve the pain of a nose rubbed raw. Gargling with salt water helps get rid of the thick mucus that can collect at the back of the throat, especially after you’ve been lying down. It can also help ease stuffy ears. A daily dose of honey can help you to feel energetic and stay healthy. It also has antibacterial and antimicrobial properties; if you do develop a sore or scratchy throat, honey will soothe and help heal. Use it in your tea, coffee, plain hot water or by itself. This can help to relieve stuffiness and congestion. Boil a pot of water on the stove and then slowly breathe in the steam. Be careful as steam can cause burns. If the steam makes your nasal passages burn, pull your head back slightly and breathe in more slowly. Run the water with the bathroom door closed to make your own personal sauna. The steamy air opens your head and chest while it moistens and thins the mucus in your sinuses. If it’s hard to swallow without pain, try a hot chicken soup. Add pepper, garlic, curry powder, or other pungent spices to thin mucus in your mouth, throat, and lungs. It can pump up the number of disease-fighting white blood cells in your immune system. Be a couch potato and listen to your body. If it’s telling you not to exercise, don’t. If it’s urging you to spend all day in bed, do. 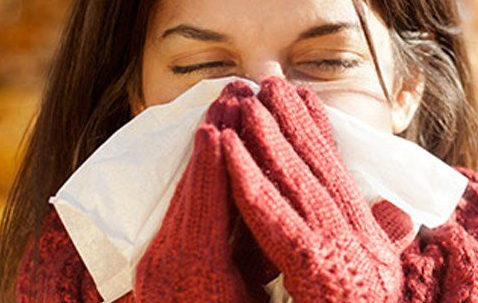 Don’t press on with daily chores even in the face of severe cold or flu symptoms. Rest is “another way of supporting the body’s ability to fight infection.